Did Amelia Earhart perish at sea on July 2nd 1937, or did she make an emergency landing only to become a prisoner of Japan? Did her flight include a path that observed Japanese naval forces preparing for war? The return of America's sweetheart was to be celebrated on the 4th of July, but instead she earned a place in history as a great unsolved mystery. To solve this riddle, a recently declassified photograph was discovered in a misfiled archive collection. Could this be the last photograph of Amelia Earhart and her navigator as they helplessly watched their airplane being towed into a Japanese harbor? The first step was to test the authenticity of that photograph, and then perform critical measurements, as can be seen during my appearance on Amelia Earhart: The Lost Evidence airing July 9th, 2017 on History. Due to the time limits of the episode, and the fact that looking over my shoulder for 20 hours is as exciting as watching grass grow, viewers will only see a brief portion of my work. So what did I actually do, and how? First the physical photograph was converted into a digital version using a professional grade scanner working at a 2400 dpi optical resolution (nearly six million dots per square inch), which exceeded the photographic resolution of the field cameras and film available in the 1930's. To avoid contaminating the digital version, the photograph and scanner were delicately and meticulously cleaned, all scanner effects were disabled, and the resulting file was saved at full bit depth without applying any compression. In other words, all of the available photographic details were preserved for my digital analysis. I then performed an extensive series of industry accepted forensic tests as I searched for any signs of tampering. Thus, an absence of positive results would serve as compelling evidence of photographic authenticity. Because the scanned photograph was composed of nearly a quarter billion pixels, I visually inspected those pixels in 4k quadrants using a 4k resolution monitor, such that each pixel always had a one-to-one representation. I searched each quadrant for artifacts resulting from either residual dust on the physical print or scanner, or any defects resulting from the handling or age of the physical print. I also searched for any unexplained artifacts, and no such anomalies were detected. Cumulatively, the artifacts accounted for less than 0.001% of the total pixels, which was both insignificant and easy to mask from further testing. • Subtle deviations in the shadow paths cast by any object relative to all of the other depicted objects. • Inconsistent variances in the focal point at all points and distances of the objects in the photograph. • Luminosity imbalances at different energy levels and overall to the expected range distribution. • The existence of moiré patterns or color artifacts that cannot be explained by scanner digitizing. • Edging inconsistencies between objects in the photo or era inappropriate lens-photography factors. It is important to know that science is rarely defined in absolutes, which is why even gravity is referred to as a theory. Scientists use a scale to define their confidence, and in my industry we use the Bell curve grouped by its standard deviation, or Sigma. One Sigma represents a 68.27% probability or likelihood of what is being claimed, two Sigma is a 95.45% probability, and three Sigma represents 99.73%. Although the Sigma scale continues indefinitely, as an industry we generally stop at Sigma three due to the limits of a reasonable margin of error. After several days, and many cups of coffee, my analysis was complete. The photograph had successfully passed every test and, in my vast professional experience, I have never encountered a tampered photograph of comparable resolution that could pass all of the applied tests. Thus, I can state with our industry's highest confidence, over 99.7 percent (Sigma 3), that the Amelia Earhart photograph is authentic and unaltered. With the photograph deemed authentic, the next major quest is determining who is depicted within that photograph though facial and anatomy matching. Furthermore, geographic and typography aspects can be used to determine if the photo's caption: “MARSHALL ISLANDS, JALUIT ATOLL, JALUIT ISLAND. 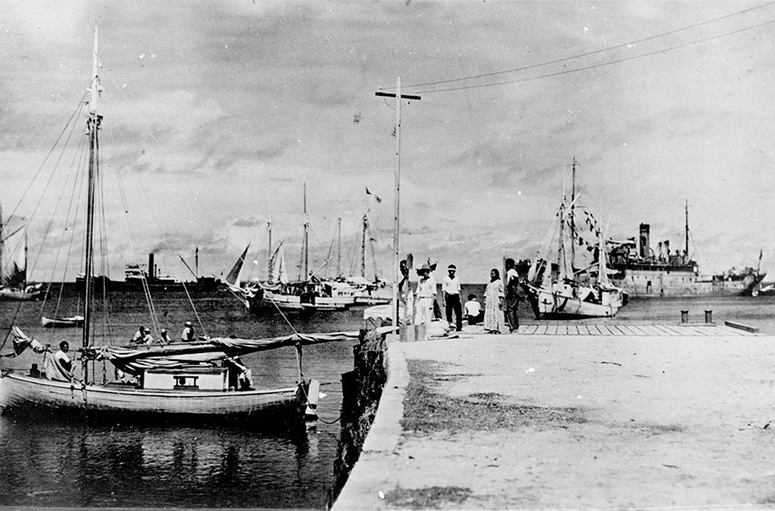 JALUIT HARBOR” accurately describes the depicted scene. It is my understanding that both of these questions are addressed in the History special by experts within those specialized fields. My last contribution was to aid in defining the airplane-looking object (farthest right halfway down in the above image) being towed behind the large ship. To accomplish this, I measured the pixel length of the object and the pixel distance between the decks of the large ship. After accounting for the relative distance and angles of both measurements from the camera's position (a process called Single Image Photogrammetry), I was able to establish a size ratio between the two measured objects. Once I knew the actual size of one object, simply multiplication would provide me with the true size of the other. To remove bias, this ratio was calculated prior to knowing the dimensions of either the ship or airplane. The cargo ship was identified as the Koshu Maru. Using its measurements I was able to calculate the airplane's overall length to be 38 feet, which was consistent with the known 38.7 foot length of Earhart's Lockheed Electra airplane. In summary, I was able to prove the photograph's authenticity, and that what it depicts is trustworthy. Furthermore, I was able to prove that the depicted airplane is consistent with the known facts of Earhart's disappearance. As a final step to aid the other experts, critical areas of the photograph were enhanced using VideoCleaner to increase both visual acuity and resolution. What do you think? Is that Amelia Earhart and her navigator Fred Noonan depicted in the photograph? Did they die as prisoners of war and, if their airplane was flying over restricted waters, why? This story is far from over and I was honored to have been asked to contribute to its historic narrative. 1. The photo album's only reference to 1935 is an un-numbered publication date page that does not reference, and is not bound to, any other page. Since the entire collection is loosely held together by string, we cannot assign the claimed publication year to any of the included photo pages simply by their mutual proximity. On July 15th, 2017 I learned of a press release claiming that the dock (depicted above and in the photo album) was built in 1936, thus invalidating the claimed 1935 publication date of the photo album. The Marshall island's press release webpage does not include this document and, in the absence of independent verification of authenticity, it shall not influence my photo album summary opinion below. 2. The photo pages are numbered in English while the photo index page uses non-English numbers. Furthermore, the map page is a mixture of both languages plus red markings. This shows that some pages were created in one language, with color and another language being added at a later time. Thus, the photo album cannot be presumed to have been created within any specific year. 3. The photo album contains photo #36 twice, while photo #38 is absent. This is inconsistent with the index of the photo album, proving that post-creation changes occurred. The entirety of both album #36 pages are identical (even the subtle grey scale paper defects), yet they are from different pages of the collection (examine the edging to determine each photo's page depth into the collection). This proves that pages were removed, copied and reassembled an unknown number of times. 4. Album photo #44 is comparable to the photo that I examined. Since the photo album paper cannot support the resolution of the National Archive photo, and the National Archives photo lacks the visual/paper anomalies observed in the photo album, this proves that the photo album's version is not the original photograph, but rather a later generation copy. In summary, we know that photo #44 is a later generation copy, as may be the album's unattached publication page, and that both are from unknown sources. We also know that this photo album was disassembled, copied, reprinted, reorganized, and reassembled with no means to determine when, or the source material used. Furthermore, album photo #44 serves to support the authenticity of the photo that I examined for History by depicting a substantively comparable representation; similar to how the later released medical photographs supported my enhancement work on the George Zimmerman story.